I’m off to Dubai for a week of meetings, but I want to leave you with some ideas that should leave you…questioning…The Bear Case on oil. I want to be clear…I’m not a perma-bull on oil. Far from it. I’m an investor, and a trader, looking for a trend. Energy is my chosen field right now. So I don’t care which direction oil moves–as long as it moves; show me a trend. The oil price staying flat is a trend. So where is oil going? While the reality is–nobody knows–there is some evidence emerging that suggests the global oil market is a lot tighter than most people believe. 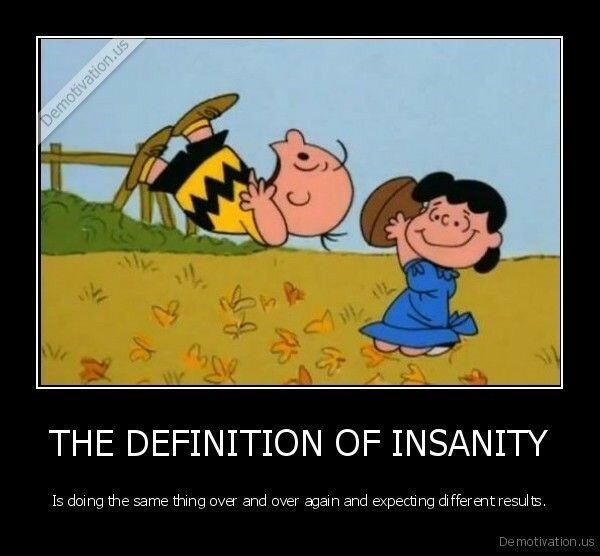 Remember poor oil Charlie Brown trying to kick that football? Lucy tricked him every time. The International Energy Agency trick investors every year. Because the IEA makes the same error each and every year: they chronically underestimate global oil demand by a wide margin. US brokerage firm Raymond James took the IEA’s initial reporting of global oil supply and demand over a 15 year period and compared it to what the IEA’s final figures were for the same period several years later. They found that on average the IEA had to revise its demand estimates higher by 700,000 barrels per day. Bolding and underling of their conclusion intentional! That is the size of the error in an average year. What then happens in a year where oil prices have been cut in half? This year there is good reason to believe that the IEA has underestimated demand by a lot more than 700,000 barrels per day. The IEA’s initial second quarter report included a 1.7 million barrel per day “plug” which was required to balance their numbers. A “plug” is accountant lingo for “I can’t figure this out”. It’s like a contingency fund. The IEA had to include this plug because inventory levels didn’t rise as much as the IEA’s estimates of supply and demand said they would. The IEA thought that the oil market was oversupplied by 3 million barrels per day, but they could only account for 1.3 million of those barrels. I know it’s a crazy thought….but could the plug relate to the IEA underestimating demand? I know I’m thinking outside the box, I mean after all they have only done exactly that for the past 15 years in much less volatile markets. With oil prices under $50 per barrel, it would make a lot of sense that they have underestimated demand this year by much more than they usually do. Remember, the IEA data is a primary source of inputs for oil market analysts. That means that this underestimation by the IEA has filtered through oil analysis everywhere–potentially making almost every analyst’s estimates of demand significantly too low. An acorn dropped on Chicken Little’s head and she ran around telling everyone who would listen that the sky is falling. China’s economy is clearly slowing, and that has translated into the media repeating over and over and over again how weak China’s demand for oil is. It is very easy explanation for weak oil prices, but I don’t think these Chicken Little’s have actually checked any data to support their claims. 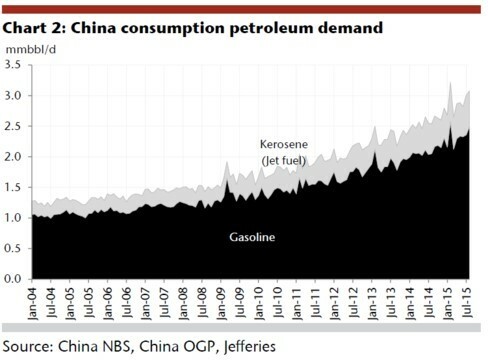 The reality is that China’s oil demand is just fine thank you very much. According to Platts Chinese oil demand was up 10% year on year in August of 2015. It’s up about 8.8% on the year in total. and wasn’t August the month that the weakness in China’s economy really rattled the markets? Clearly China isn’t firing on all cylinders. But it’s also clear oil consumption is not suffering. That doesn’t seem to add up, but there is an explanation. What has happened is that Chinese demand is changing. Oil demand from industrial consumers (users of diesel) has levelled off as subsidies of infrastructure projects have dropped. What has more than offset this is consumption growth of gasoline and kerosene from non-industrial consumers. An even bigger surprise (certainly to me) might be what has happened to China’s oil inventories over the summer. 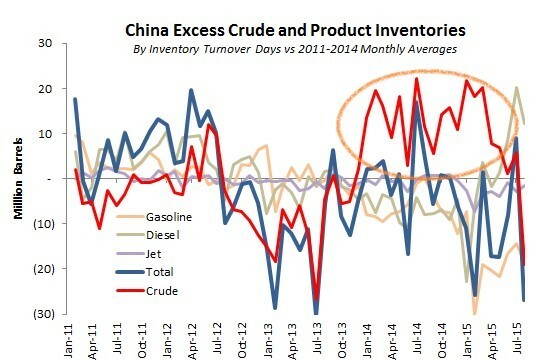 As Stephen Kopits of Princeton Energy Advisors points out, August commercial oil and refined products inventory levels relative to rates of consumption in China didn’t just not increase….they actually decreased. That can’t happen if oil demand is plummeting. That’s weird, because if the IEA’s 1.7 million missing barrels aren’t in China….where else could they be? 3. Where Is The Contango? A few weeks ago Goldman Sachs rattled a few cages by suggesting that the oil glut had actually gotten worse in recent weeks and that $20 per barrel oil was a real possibility. Since Goldman was likely using the 3 million barrel per day oversupply figure it took from the IEA for Q2, saying things had gotten worse was really saying something. If the oil glut is as huge as Goldman suggests a question that has to be asked is “why aren’t we looking at a severe contango in the oil futures market”? A contango structure in the futures market is when front month oil prices trade at a discount to future month oil futures prices. The futures curve slopes upwards and to the right. In an environment where there is a massive oversupply we would typically expect to see a severe contango situation where front month prices trade at a big discount to future months. Too much near term supply would obviously put significant pressure on near term prices. When oil demand collapsed in 2008/2009 and a serious oversupply situation clearly existed the difference between the front month and a year forward was over $23 per barrel for WTI. As of last week the year forward price for WTI was roughly $4 higher. That doesn’t seem to scream “glut”. There’s more. Did you see the market action following last week’s EIA report. The report was decidedly bearish…..yet oil stocks performed well and oil held up too. To me that says the Market believes–that while oil will not go up in a straight line…the bottom is in, and that psychology (for now) is all that’s needed to see a lot of money come back to the sector. Of course, the Market could be wrong, but last week’s action was compelling. (There will almost certainly be some consolidation/choppy price action in oil this week as the Market digests these gains). It’s enough to get nibbling my favourite oil stocks in small chunks. One is absolutely the lowest cost, most profitable producer I see in the whole world at US$50 oil. The second is an old favourite who…did what the good management teams do in down markets. They buy other assets cheap, and get themselves (and their shareholders) in a great position to profit. Next post: Oil and Gas–in the Bahamas?